Hey there, little ice princess! Even though lake Zurich probably won’t freeze this winter either, there are many possibilities to ice skate in town. 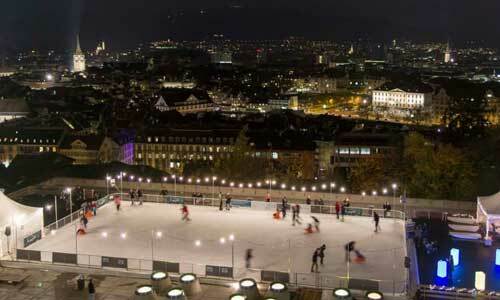 One of our favorite places is the ice rink on the terrace outside the ETH – the view over the old town is spectacular! The ice rink will be open free of charge until 14 December 2014. A highlight for all the ice skaters in Zurich is the annual ice disco at the Dolders ice rink – live djs, mulled wine and of course ice skating will make a perfect afternoon. It takes place on the 20. of december. For an overview on the cities ice rinks, check here.